Read about more Miami Scholars' accomplishments in the news. 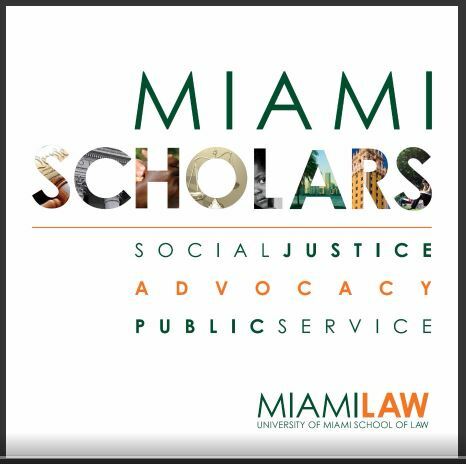 Since its inception in 1997, bringing outstanding students with a passion for public service to the University of Miami School of Law has been the goal of the Miami Scholars Public Interest Program. Incoming students with exceptional academic and public interest achievements have the opportunity for selection for this prestigious scholarship cohort program. Miami Scholars serve as social justice leaders and on our campus throughout numerous student organizations and individual projects and initiatives. They contribute meaningfully to creating a pro bono ethic among their peers. Many Scholars serve on the Public Interest Leadership Board (PILB), developing and implementing outstanding programs and projects dedicated to social justice, alumni/development, community engagement, education and career development. Miami Scholars are actively engaged leaders with a commitment to social justice, community engagement, and advocacy. Read more about the Miami Scholars program. This program requires a supplemental application in addition to the J.D. application. The priority deadline for consideration is January 7, 2019 and the final deadline is April 1, 2019. For more specifics on applying to the Miami Scholars program, visit the Miami Scholars' section in the Financial Aid Scholarships page of this site.